The air was thick with color that landed cold on the backs of our necks and tasted of starch – sticky on the tongue. Music pounded in the background as a burst of neon green rained onto the outstretched arms of about 150 screaming students. Everyone began to shout with excitement as organizers ran with bags of bright pink and purple powder, dumping small mounds of it into extended hands. 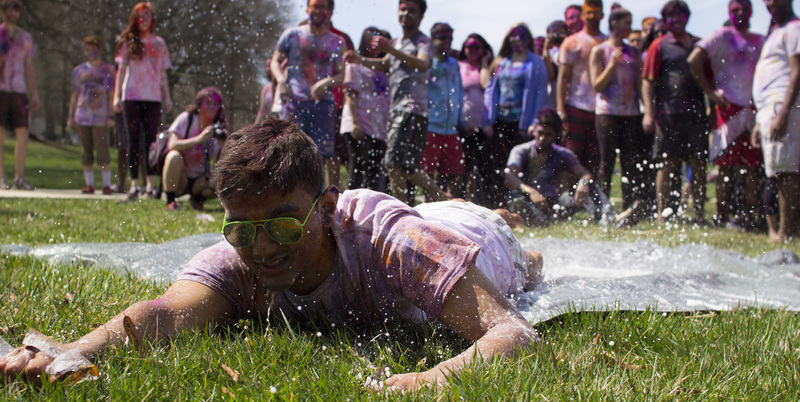 Students rode down a tarp slip and slide, their bodies covered with a spectacular and jarring mix of rainbow streaks and mud. The crowd gradually returned to its original place at the base of McKeldin Mall as the number of participants increased to about 300. 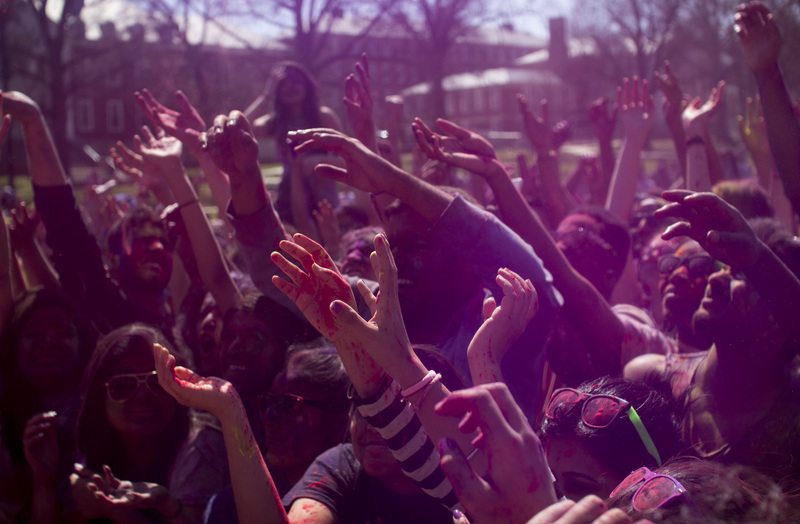 Holi is a Hindu festival that celebrates the coming of spring, the triumph of good over evil and the healing of broken friendships. The event invites participants from all walks of life, allowing them to break free from social norms, share colors and relish with joy. Lakshmi Kirkire, junior cell biology and Spanish double major, and assistant organizer of the event explained the significance of the event in India. Indeed, the event gave students the opportunity to participate in something entirely new. “I had never seen an event like this before coming to this university,” Blair Warrick, a senior psychology major, said. In some countries, the festival progresses for a week or several more. In a burst of yellow, a friendly stranger grinned and hugged pink and purple-faced strangers within arm’s length. He lifted me onto his shoulders, eliciting excited cheers from the crowd. No head was untouched by color. Some students danced, some swayed, others jumped up and down. All were spinning to-and-fro, grinning and greeting friends amidst gentle showers of soft powder. There was even a small inflatable pool for participants to play in. Organizers threw out bags of pink, green, purple and yellow powder every few minutes, and the lucky participants who caught them would shake piles of it into the eager hands of the mob who descended upon them. Everyone was indulgent in joy and greedy for good spirits. As the afternoon clouds lifted, there was a light breeze and the sun illuminated colored heads. 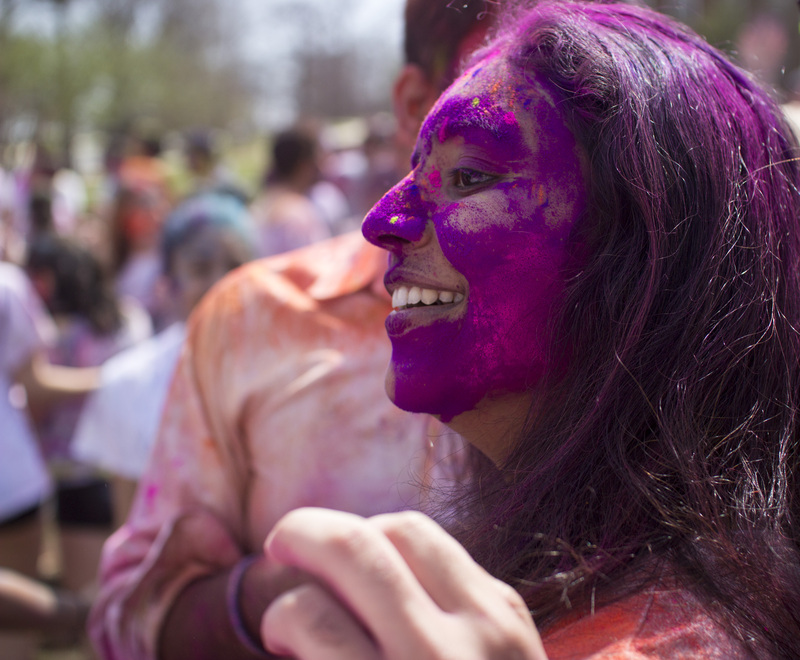 “I had a great time today and I know it’s all about celebrating life and color and so I think today was the perfect day cause it’s so nice out,” recounted senior marketing and finance major Azra Husain. Hindu Students Council hosted the event, Kirkie said. “We get the color by asking temples around the area, or we order it from India and it gets shipped here,” Kirkire said. She explained the colors are made out of starch, which makes them hypoallergenic and non-stick. 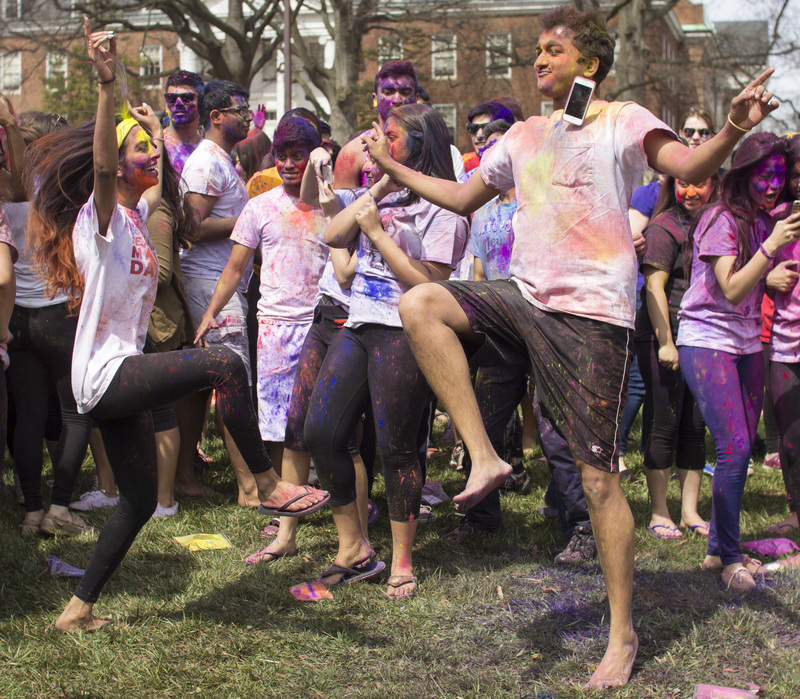 Although Holi is one of the least religious of Hindu festivals, Kirkire also said it is a great way to raise awareness about Hinduism. “It’s one of the more active holidays we have, where you’re running around and doing things. It’s an easy way to teach people about what Hinduism is without being too out there,” she said. Religious or not, it is a holiday for everyone to celebrate the universal appreciation of friendship, renewal and the coming of spring. As we left the event and returned to our dorms, strangers cast curious glances. All participants arrived clean and orderly, wearing white T-shirts. They left refreshed and unrecognizable, doused in color and ready for spring.